Tired of getting paper statements? If you’d rather avoid the clutter and stop receiving paper statements, you can easily turn on the eStatement feature through your Online Banking. Once you sign up, you will receive monthly email alerts letting you know that your statement is ready. 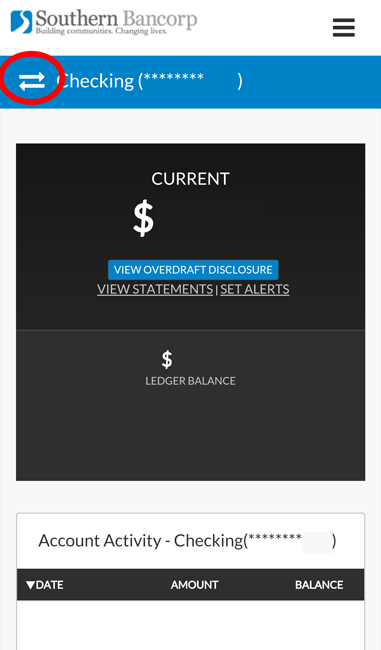 You can view, save, or print the current or past statements at any time through Online Banking. Where do I sign up for eStatements? 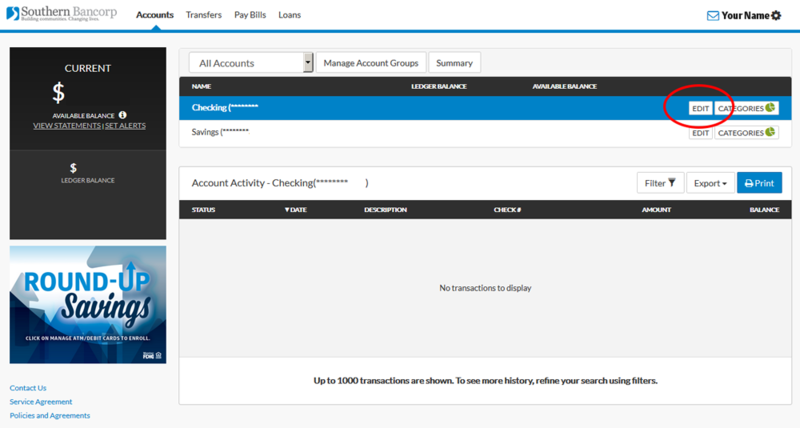 First, log in to Online Banking. This can be done on your mobile phone or on a computer. 1. Click on the Edit button of the account you’d like to change. 2. 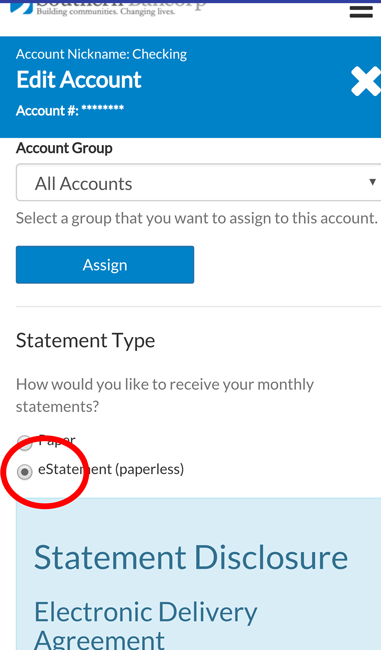 Under Statement Type, click the radio button that says eStatement (paperless). Read and review the Statement Disclosure. 3. Agree to the terms by checking the checkbox and click Save Statement Settings. 4. Repeat the process with each account that you would like to change. 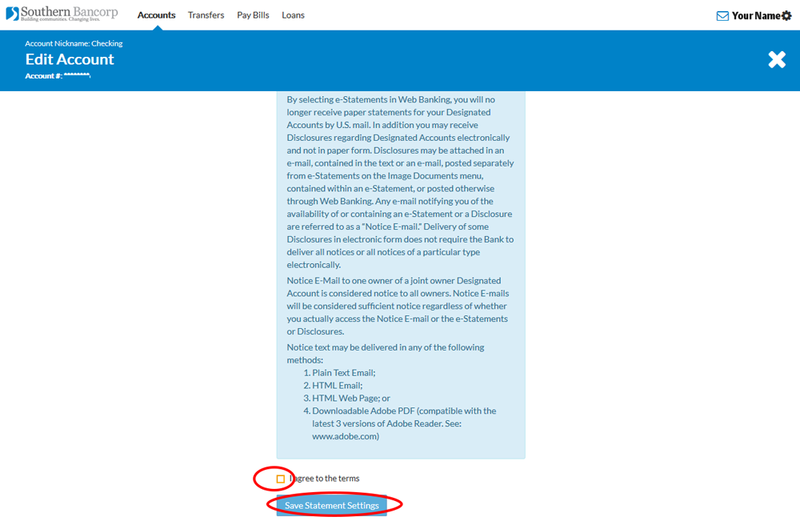 You may change back to paper statements at any time (some monthly fees may apply if you change to paper statements, depending on which account you have). 1. Click on the Switch Account two arrows button. A sidebar menu will appear. 2. 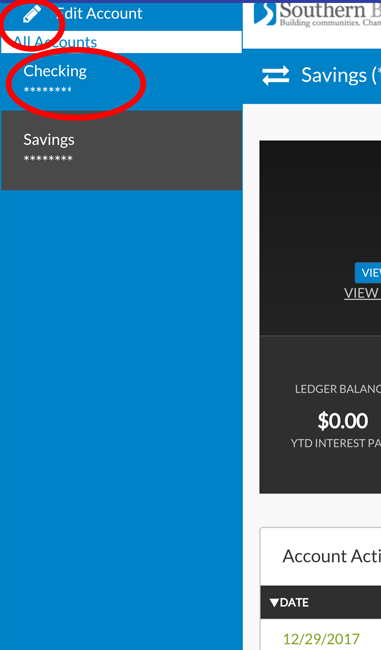 Make sure that the account you’d like to change is active by pressing it (blue means active), then click Edit Account. 3. 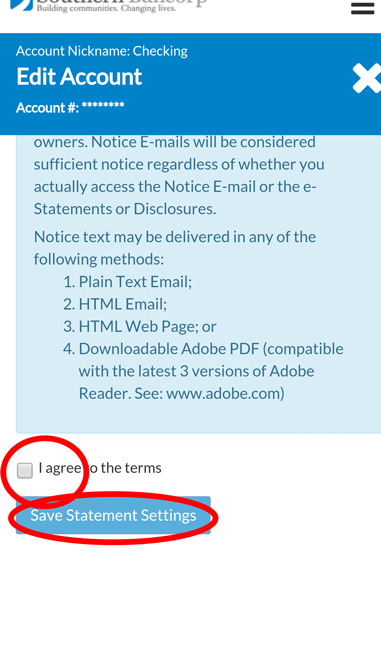 Under Statement Type, click the radio button that says eStatement (paperless). 4. Agree to the terms by checking the checkbox and click Save Statement Settings. 5. Repeat the process with each account that you would like to change. 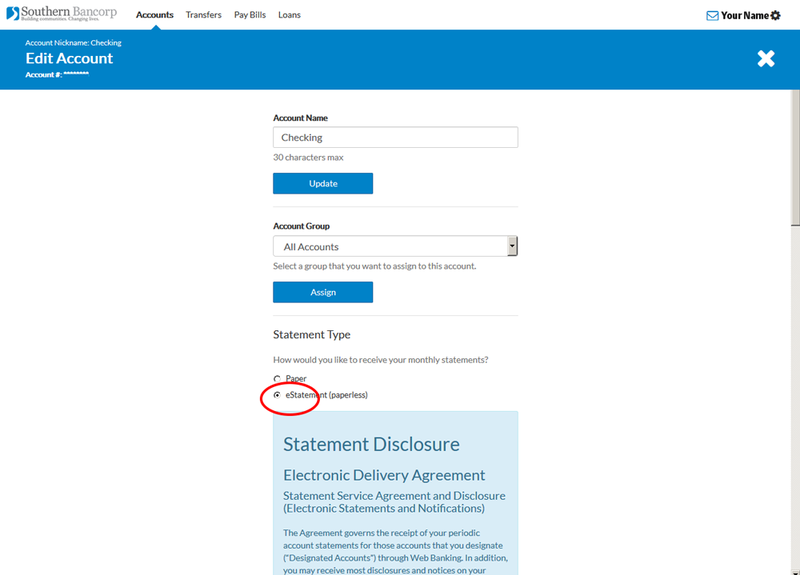 You may change back to paper statements at any time (some monthly fees may apply if you change to paper statements, depending on which account you have). Whether or not you have eStatements turned on, you can always access your current and past statements through Online Banking. Just select the account you’d like to view and click View Statements. A list of statements will show. You can either view within your browser or save/print them by downloading the PDF. NOTE: the PDF option is not available through your smartphone or mobile app, so you will have to use a tablet, laptop, or desktop to access them.